Is Your Food Digesting or Rotting in Your Gut? Eating in a manner whereby food does not digest completely will ruin our health. Eating in a manner which enables perfect digestion is the pathway to flourishing health! Humans are provided with the senses and faculties to select and completely digest our most nutritious and biologically suitable foods. However, in our modern society we have departed from instinctual, simple whole foods and digestive maladies run rampant. Happily, with the help of some guidelines, we can correct our harmful eating habits and establish excellent digestive health. • the promotion of excellent, dynamic health, physical beauty and longevity. When we eat unwisely, whether in our choice of food or in our manner of eating (we do have digestive limitations! ), nutrients decompose in our gut via the action of bacteria. Under this scenario, fermentive and putrefactive bacteria decompose the food matter, weakening the intestinal tract, impairing nutrient absorption, defiling our entire body with pathological substances, impairing our mental functions and causing fatigue. This condition is known as “toxicosis” (general bodily toxicity or “auto-intoxication”) or, less formally, as “food drunkenness”; it impairs our health and eventually imperils our life. Indigestion (flatulence, belching, bloating) and foul bowel and body odors are just some of the unpleasant warnings signaling the beginning of illness. Furthermore, the overeating of slow-digesting fatty high-protein foods causes the stomach to secrete and retain copious amounts of acid. When this hyper-acidic condition occurs chronically, the stomach and intestines can become inflamed and ulcerated and the pylorus sphincter, which normally allows food to enter the duodenum, can become swollen shut. This typically leads to fermentation and putrefaction of the stomach’s contents, GERD (gastroesophogeal reflux disease), vomiting and great pain. Chronic inflammation and ulceration lead to cancer. Here are basic, time-tested, scientifically proven healthful eating guidelines for promoting optimum digestion and gut health. Choose raw, fresh, ripe, organic, whole, vegan foods. Base your diet in fruits and vegetables and eat only those foods which are attractive to your senses, especially your sense of taste. Obtain enough calories from fruit to maintain sustained peak energy and internal cleanliness. Avoid animal-derived foods—they are poorly digested and toxic when cooked. If you choose grains and legumes/beans (neither are recommended, since they also digest poorly), select them in their whole state and either sprout or cook them lightly. If you choose to cook vegetables, light steaming is the least deleterious method; however, they won’t digest perfectly, either. Fashion a diet with close to 80% of the calories from carbohydrate, 10% from protein and 10% from fat. Deriving more than 10% of your calories from fat and/or 10% from protein will invariably exceed your digestive limitations, resulting in toxicosis and disease. Follow food combining guidelines to a “t.” Eat fruit only on an empty stomach, alone or with leafy greens, celery and/or cucumber. Eat melons alone. Eat citrus fruits at least one-half hour before non-acidic sweet fruits. Starchy foods (squash, potatoes, grains and old carrots) combine well with all vegetables and bell peppers; they do not combine well with tomatoes or other acidic or sweet fruits, nuts, seeds and avocados. Fatty, high-protein foods (nuts, seeds and avocados) combine well only with non-starchy vegetables (greens and celery), cucumbers and minimal amounts of acidic fruits including tomatoes; they do not combine well with starchy or non-acidic sweet foods. The best sequencing is fruit-and-greens meals during the day, then, optionally, a glass of raw vegetable juice followed at least one-half hour later by a dinner of vegetables with one fatty food, i.e., avocado, nuts or seeds. Note: it is not necessary and, in many cases, unhealthful to eat a fatty food every day. Furthermore, it is OK to have a dinner of simply more fruit and greens. It is most beneficial to space meals as long as is comfortably possible. Assuming you are not so fatigued that you need to take a nap to restore your energy, a slightly uncomfortable feeling in the back of the throat and a dip in your physical and/or mental energies are the signs that it is time to eat again. Sweet, juicy foods, eaten in sufficient quantity, will quell hunger, rehydrate you and supply your caloric fuel needs. To put it simply, eat sufficient quantities of nutritious, simple carbohydrate-rich, whole foods—primarily fruit—to keep your blood sugar and hydration at a level which assures sustained physical and mental performance. Eat one or two types of juicy, sweet fruits for breakfast, or have a glass of fresh juice made of fruit and celery and/or greens, or a smoothie made of the same. Follow that with different types of fruits for each of the following one to three meals, eaten with or without greens, celery and/or cucumber, taking them in sufficient quantity for satiation and sustained energy. If desired, drink raw vegetable juice, then at least one-half hour later follow it with a simple salad of vegetables and fruit-vegetables such as tomato and bell pepper. If you include carrot in your vegetable juice, avoid having tomato with your dinner. If you desire a fatty food, have one to two ounces of nuts or seeds blended with vegetables, tomato or orange juice as a dressing, or two to four ounces of avocado. Caution: it is generally imperative to avoid fatty foods, raw vegetable salads and acid fruits if you are fatigued and experiencing inflammation and illness. If you prefer a meal of more fruit for dinner, that is generally a healthful choice—follow and trust your senses when they call for raw, delicious foods! For further insight, study Self Healing Colitis & Crohn’s and Digestion Perfection. These books are available from the Colitis & Crohn’s Health Recovery Center Bookstore at www.shop.colitiscurebook.com. 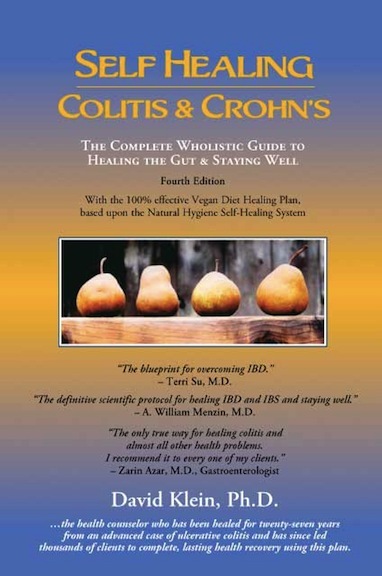 Also see www.colitis-crohns.com and www.digestionperfection.com and www.veganhealingdiet.com. If you are seeking health guidance, I offer international counseling by phone and Skype. Please feel free to contact me at dave AT colitis-crohns.com, or dave AT digestionperfection.com, or 808-572-0861 (Hawaii). I will be glad to help you.